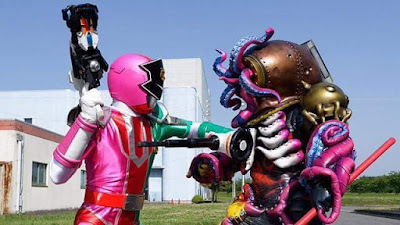 It looks like Sakuya will be having a very bad day as he makes a big mess and smashes his leader's face on the 19th episode of Kaito Sentai Lupinranger VS Keisatsu Sentai Patranger! "As usual the public is still largely in favor of the Lupinrangers. The superior officer of the Global Police comes into the Patranger's office and starts to argue with them. Sakuya, in hopes to quell the argument, decides to take Hilltop and his boss to eat at Jurer. Both Touma and Umika decided to operate through the situation as cleverly as possible, but Kairi is still not back to work yet! Meanwhile, reports are coming in of cars being split in half when there is no one around. There were reports that gusts of wind were blowing just before, but just how much natural power can split a car in half?!"